The machine head is one size larger than the conventional head, expanding the space under the machine arm for increased operability. With its direct-drive system, the machine starts up smoothly and offers excellent responsiveness. With its newly developed large machine head, the DDL-9000 dramatically upgrades seam quality and increases efficiency. 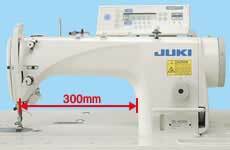 JUKI has developed a new high-long arm machine head one size larger than the head for the conventional lockstitch machine. 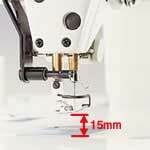 With its wider area under the arm, the machine permits easy handling of the sewing material for improved operability. 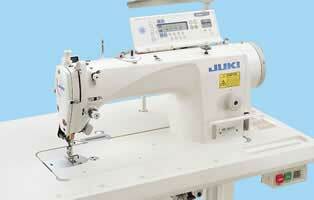 * The space under the arm is approximately 4 cm wider and 1 cm higher than that in JUKI's current lockstitch machine. The jaw of the machine arm is located 1cm higher than that of the conventional machine. By ensuring easy observation of the needle entry area, the operator can run the machine in a more comfortable posture. The machine head frame is designed for optional balance and high rigidity. The use of this frame in conjuction with the machine's direct-drive system dramatically reduces operating noise and vibration. The DDL-9000 incorporates a direct-drive system (DD system) that offers quick start-up, upgraded stop accuracy, excellent responsiveness, and a stronger needle thrust for faster, better penetration into the material. In the machine's newly introduced direct-drive system, a compact AC servomotor is directly connected to the main shaft. This motor demonstrates quick start-up, upgraded stop accuracy, and excellent responsiveness. Since the machine uses no V-belt, the power consumption is reduced and belt chips are eliminated. Designed without an oil pan, the machine offers improved maintainability with easy removal of dust and lint. The dry-head-type machine (D type) operates without lubrication. 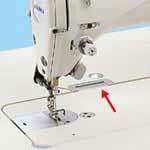 This means the machine produces no oil splashes during sewing, freeing sewing products from the risk of oil stains. The machine requires neither periodical oiling nor oil level adjustment, saving you time and trouble for maintenance. The minute-quantity lubrication type machine (S type) only feeds clean oil from the oil tank to the hook and needlebar. This self-enclosed system stays clean since it doesn't use any reflux oil. 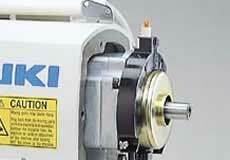 This is very important for smooth operation when running at high sewing speeds (5,000rpm at maximum). With its newly designed feed mechanism, thread take-up and light-in-weight mechanism, the machine offers both upgraded sewing capabilities and excellent operability. The presser foot mechanism is made of aluminum to reduce the weight. 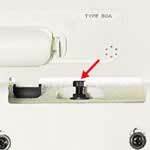 This light-weight presser foot prevents jumping when the machine runs at high speeds and responds quickly when the operator changes the sewing direction for straight portions and curved portions of the material. The machine can be used for wider range of materials and permits easy adjustment of the height, inclination, and timing of the feed dog. The machine has been developed based on thoroughgoing studies on safety, maintainability, reliability, and durability. 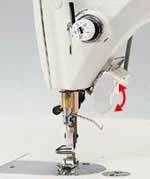 The machine saves you the time and trouble of removing the knee-lifter and cover. This means that the machine head can be tilted for cleaning and maintenance without the inconvenience of removing the knee-lifter and cover. 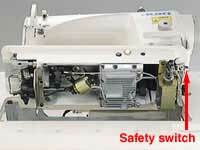 Even if you tilt the machine head while the power is still ON, the safety switch will disable the machine. This means the machine won't start running when the head is tilted even if you press the foot pedal. The handwheel is provided with a special mechanism to prevent the tangling of thread and hair. This is one more effective safeguard in a list of many. Installation of an attachment-mounting seat improves operability when replacing the attachment and increases the durability of the machine bed surface. 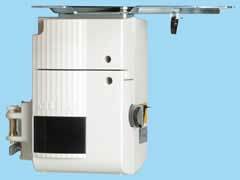 The machine is provided with a well-proven horizontal-type thread-trimming mechanism that ensures speedy and reliable thread trimming. The machine is provided with various easy-to-operate functions for increased operability. The machine has a push-button-type reverse feed switch. The machine is provided with a tension-regulating knob and presser spring regulator, both with calibration markings. The bobbin winder is built-in at the top surface of the machine head. The machine is equipped as standard with a micro-lifter. The hinge has been moved 10 cm from behind the needle entry point.